One of the unlucky nations in the Eurovision Song Contest is Portugal. This year it will be the 42nd Portuguese entry, but in all those years the best rank was the 6th! Even if the entries from Portugal were native, authentic often brilliant with high profession and convincing, but there were only a few votes flying over to Portugal. Even Spain has not been too generous with votes for Portugal. Last year Vania Fernandes was very close to bring back Portugal’s pride with a very good song which was handled as the black horse. She was even 2nd in the semi final and has qualified for the final and came 13th at the end. 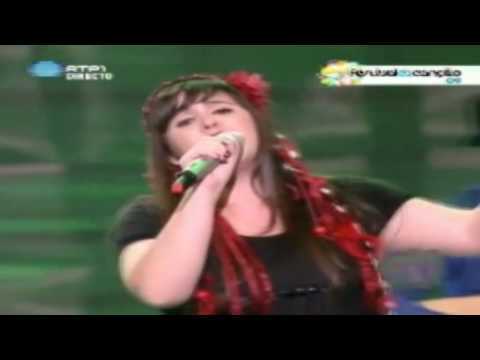 Even if it’s a success for Portugal, many people were disappointed, because the Song “Senhora do mar” really had the quality and the chances to win the contest. This year we will hear another native and genuine entry which sounds very folkloristic and also optimistic. Flor-de-Lis is the band with the lead singer Daniela Varela, they all have a bit of the hippie look with flowers in their hair, accordion and folkloristic dance interludes. Hopefully it will bring a harmonic atmosphere to Moscow and melt the European hearts. Unfortunately, this song does not come close to last year’s song, but it’s still better than many songs of the 2009 edition.